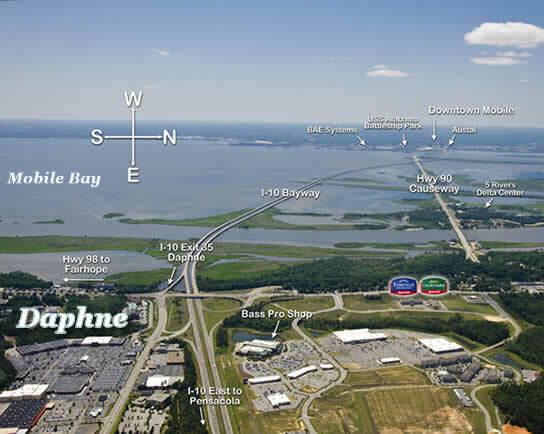 Welcome to Daphne, the "Jubilee City", a community rich with heritage, pride, nature, & small town neighborhoods. The Eastern Shore Trail that runs from the Causeway starting with Alligator Alley boardwalks, through Olde Towne & into Montrose, along with many other trails, piers & boardwalks of Bayfront Park, ball fields of Al Trione Sports Complex, bayfront MayDay Park & Centennial Park in Olde Towne, make Daphne a great place to get outside know your neighbor, let the kids play, talk a walk, ride, or shopping adventure, or just sit at a roadside diner & enjoy fresh seafood. As the phenomenon known only to our little corner of the world, "jubilee" has an abundance of seafood, Daphne also has an abundance of quality of life things to do! Beau Chene is a gated community in Daphne, Alabama with up to one acre home sites currently available, located off highway 181, with easy access to the Interstate, as well as Malls, Dining, Golf, Fishing, Parks, Bowling, Movie Theatres, and more! Beau Chene is surrounded by Alabama's lush forests and farmlands, but very close to Mobile Bay & many picturesque small towns, brand-new malls and fantastic schools. Beckham Partners Real Estate Team - #1 Top producer since 2006! Michelle Beckham, a native of the Gulf Coast, has been married and living in Baldwin County, AL for over 20 years. Having owned property in Daphne, Spanish Fort and Gulf Shores, I can also advise you in all areas of Eastern Shore living. Michelle is a member of both Mobile & Baldwin County Boards of Realtors, and MLS Systems, providing her exposure to over 2,500 local realtors. With 10 communities in Spanish Fort, 14 communities in Daphne, 3 communities in Fairhope, 3 communities in Gulf Shores, and 3 communities in Orange Beach, many more in Foley, Loxley & Robertsdale, as well as 2 offices to serve you throughout Baldwin County, our company has the diversity and ability to find the exact property that you have in mind. I am a licensed Realtor. I specialize in representing my clients in the purchase and sale of single-family residences and income property within Daphne. I truly love this area and pride myself on my knowledge of current transactions, school districts, neighborhood information, and related services, including mortgage, insurance and inspection information. Beckham Partners Real Estate Team, #1 Top Sales Producers every year, since 2006! Nobody knows the Eastern Shore (Daphne, Fairhope and Spanish Fort) real estate better than The Beckham Partners Team, your trusted Daphne Realtors. We have been successfully selling real estate in Daphne, Fairhope and Spanish Fort for over a decade and have a proven track record for delivering results!